To understand the Obama regime’s policy toward Egypt, the Mubarak dictatorship and the popular uprising it is essential to locate it in an historical context. The essential point is that Washington, after several decades of being deeply embedded in the state structures of the Arab dictatorships, from Tunisia through Morocco, Egypt, Yemen, Lebanon, Saudi Arabia and the Palestinian Authority, is attempting to re-orient its policies to incorporate and/or graft liberal-electoral politicians onto the existing power configurations. While most commentators and journalists spill tons of ink about the “dilemmas” of US power , the novelty of the Egyptian events and Washington’s day to day policy pronouncements, there are ample historical precedents which are essential to understand the strategic direction of Obama’s policies. US foreign policy has a long history of installing, financing, arming and backing dictatorial regimes which back its imperial policies and interests as long as they retain control over their people. In the past, Republican and Democratic presidents worked closely for over 30 years with the Trujillo dictatorship in the Dominican Republic; installed the autocratic Diem regime in pre-revolutionary Vietnam in the 1950’s; collaborated with two generations of Somoza family terror regimes in Nicaragua; financed and promoted the military coup in Cuba 1952, Brazil 1964, Chile in 1973, and in Argentina in 1976 and the subsequent repressive regimes. When popular upheavals challenged these US backed dictatorships, and a social as well as political revolution appeared likely to succeed, Washington responded with a three track policy: publically criticizing the human rights violations and advocating democratic reforms; privately signaling continued support to the ruler; and thirdly, seeking an elite alternative which could substitute for the incumbent and preserve the state apparatus, the economic system and support US strategic imperial interests. For the US there are no strategic relationships only permanent imperial interests, name preservation of the client state. The dictatorships assume that their relationships with Washington is strategic: hence the shock and dismay when they are sacrificed to save the state apparatus. Fearing revolution, Washington has had reluctant client despots, unwilling to move on, assassinated (Trujillo and Diem). Some are provided sanctuaries abroad (Somoza, Batista),others are pressured into power-sharing (Pinochet) or appointed as visiting scholars to Harvard, Georgetown or some other “prestigious” academic posting. The Washington calculus on when to reshuffle the regime is based on an estimate of the capacity of the dictator to weather the political uprising, the strength and loyalty of the armed forces and the availability of a pliable replacement. The risk of waiting too long, of sticking with the dictator, is that the uprising radicalizes: the ensuing change sweeps away both the regime and the state apparatus, turning a political uprising into a social revolution. Just such a ‘miscalculation’ occurred in 1959 in the run-up to the Cuban revolution, when Washing stood by Batista and was not able to present a viable pro US alternative coalition linked to the old state apparatus. A similar miscalculation occurred in Nicaragua, when President Carter, while criticizing Somoza, stayed the course, and stood passively by as the regime was overthrown and the revolutionary forces destroyed the US and Israeli trained military, secret police and intelligence apparatus, and went on to nationalize US property and develop an independent foreign policy. Washington moved with greater initiative, in Latin America in the 1980’s.It promoted negotiated electoral transitions which replaced dictators with pliable neo-liberal electoral politicians, who pledged to preserve the existing state apparatus, defend the privileged foreign and domestic elites and back US regional and international policies. Obama has been extremely hesitant to oust Mubarak for several reasons, even as the movement grows in number and anti-Washington sentiment deepens. The White House has many clients around the world – including Honduras, Mexico, Indonesia, Jordan and Algeria – who believe they have a strategic relationship with Washington and would lose confidence in their future if Mubarak was dumped. Secondly, the highly influential leading pro-Israel organizations in the US (AIPAC, the Presidents of the Major American Jewish Organizations) and their army of scribes have mobilized congressional leaders to pressure the White House to continue backing Mubarak, as Israel is the prime beneficiary of a dictator who is at the throat of the Egyptians (and Palestinians) and at the feet of the Jewish state. As a result the Obama regime has moved slowly, under fear and pressure of the growing Egyptian popular movement.It searches for an alternative political formula that removes Mubarak, retains and strengthens the political power of the state apparatus and incorporates a civilian electoral alternative as a means of demobilizing and de-radicalizing the vast popular movement. The major obstacle to ousting Mubarak is that a major sector of the state apparatus, especially the 325,000 Central Security Forces and the 60,000 National Guard are directly under the Interior Ministry and Mubarak. Secondly, top Generals in the Army (468,500 members) have buttressed Mubarak for 30 years and have been enriched by their control over very lucrative companies in a wide range of fields. They will not support any civilian ‘coalition’ that calls into question their economic privileges and power to set the political parameters of any electoral system. The supreme commander of the Egyptian military is a longtime client of the US and a willing collaborator with Israel. Obama is resolutely in favor of collaborating with and ensuring the preservation of these coercive bodies.But he also needs to convince them to replace Mubarak and allow for a new regime which can defuse the mass movement which is increasingly opposed to US hegemony and subservience to Israel. Obama will do everything necessary to retain the cohesion of the state and avoid any splits which might lead to a mass movement – soldier alliance which could convert the uprising into a revolution. 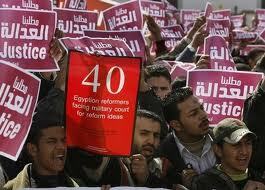 Washington has opened talks with the most conservative liberal and clerical sectors of the anti-Mubarak movement. At first it tried to convince them to negotiate with Mubarak – a dead end position which was rejected by all sectors of the opposition, top and bottom. Then Obama tried to sell a phony “promise” from Mubarak that he would not run in the elections, nine months later. The movement and its leaders rejected that proposal also. So Obama raised the rhetoric for ‘immediate changes’ but without any substantive measures backing it up. To convince Obama of his continued power base, Mubarak sent his formidable thug-lumpen secret police to violently seize the streets from the movement. A test of strength: the Army stood by; the assault raised the ante of a civil war, with radical consequences. Washington and the E.U. pressured the Mubarak regime to back off – for now. But the image of a pro-democracy military was tarnished, as killings and injuries multiplied in the thousands. As the pressure of the movement intensifies, Obama cross pressured by the pro Mubarak Israel Lobby and its Congressional entourage on the one hand, and on the other by knowledgeable advisors who call on him to follow past practices and move decisively to sacrifice the regime to save the state while the liberal-clerical electoral option is still on the table. But Obama hesitates and like a wary crustacean, he moves sideways and backwards, believing his own grandiloquent rhetoric is a substitute for action … hoping that sooner or later, the uprising will end with Mubarakism without Mubarak: a regime able to demobilize the popular movements and willing to promote elections which result in elected officials following the general line of their predecessor. Nevertheless, there are many uncertainties in a political reshuffle: a democratic citizenry, 83% unfavorable to Washington, will possess the experience of struggle and freedom to call for a realignment of policy, especially to cease being a policeman enforcing the Israeli blockage of Gaza, and providing support for US puppets in North Africa, Lebanon, Yemen, Jordan and Saudi Arabia. Secondly free elections will open debate and increase pressure for greater social spending, the expropriation of the seventy billion dollar empire of the Mubarek clan and the crony capitalists who pillage the economy .The masses will demand a reallocation of public expenditure from the overblown coercive apparatus to productive, job generating employment. A limited political opening may lead to a second round, in which new social and political conflicts will divide the anti-Mubarak forces, a conflict between the advocates of social democracy and elite backers of neo-liberal electoralism. The anti-dictatorial moment is only the first phase of a prolonged struggle toward definitive emancipation not only in Egypt but throughout the Arab world. The outcome depends on the degree to which the masses develop their own independent organization and leaders.